It was quite an extraordinary climax to Burghley today with the show jumping course causing even more trouble than normal. Parklane Hawk hung on to his 3rd place despite rolling two poles and secured me my second HSBC FEI Classics title. He had the bogey fence down which was the red London postbox fence but I was slightly surprised that he also knocked the gate. 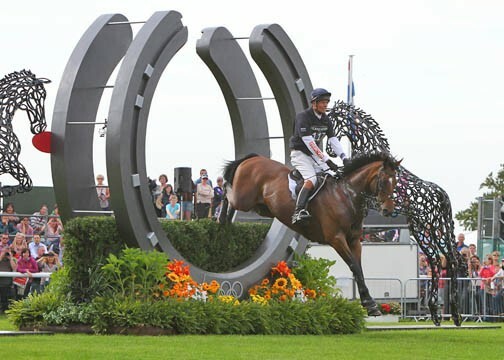 It was however very fortunate that he only had two fences down as had he had any more penalties I would have lost my lead in the HSBC FEI Classics series as well as his 3rd place. It is a great feeling to win the Classics in what has this time been a very close competition. Parklane Hawk could not have felt any better today. He bounced back from the cross country unbelievably well which is always good to know. His third place has rounded off a really successful year for him and he will now have a good holiday. It was such a shame for Sinead Halpin to have lost her lead with three fences down. She was so unlucky, particularly as her horse is usually such a good jumper. As a former part of our team, as one of my riders, we all felt thrilled that she had gone so well and after her foot perfect performance yesterday she so deserved to win. Once again Burghley proved to be the ultimate three-day event test with the cross country and show jumping so influential and it reminded me again of just what a special horse you have to have to cope with Burghley’s testing terrain. The Burghley team did a tremendous job and combined with the recent success in London it did a huge amount to boost moral on what has been a battered and bruised eventing season in the UK. Attention now turns to Blenheim next week with Bay My Hero entered in the CIC3* 8&9yo class. Seacookie also holds an entry in the CCI3* so if we feel he is on form when we get home I will take him too.